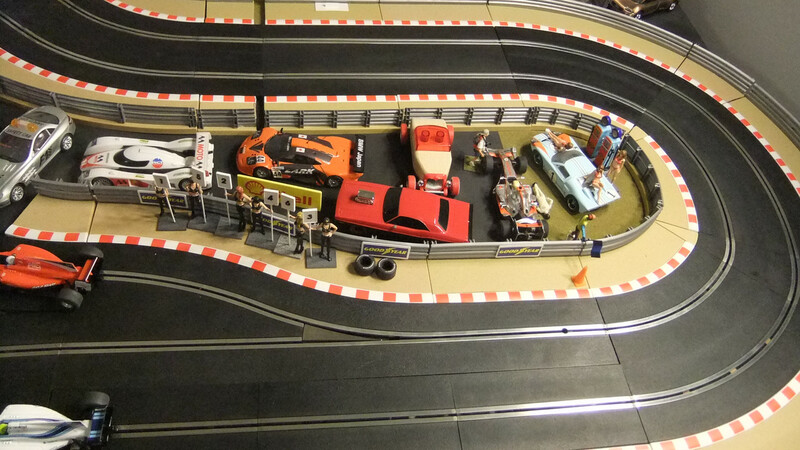 Can you run a pit lane setup with the C7015 Pit Lane Right track that works for refueling? As always, thanks in advance for any help provided. Yes you can. Here is my track. Sounds very interesting, as I am thinking ARC PRO might be the way to go for me, after fiddling around and not really getting SSDC to work correctly. 1) How many Pace or computer controlled cars can it run during a race? 2) I see it has a Windows option, so I downloaded it to my laptop. Has anyone had any success using this other than with a phone or tablet? I have run two pace cars with no problem using the magic app. I am pretty sure it will run more. Also, I am not an expert, but the Arc Pro system requires a bluetooth connection to connect the app to the power base. That's all I know. Other users can probably answer your questions more thoroughly. Also, there is a lot of information about this app on another slot car website, where he author will answer your questions directly. Last edited by borninthe50s; 07-26-2018, 10:58 PM. I have checked out that other forum, and so it seems I am about to order the Arc Pro Platinum GT set. So, with the pit function, how does the app know where the pit is? In other words, if one were to set up a long front-stretch with a Pit Right set up, and say, somewhere on the back stretch, you also had a Pit Right set up to widen your layout to 3 lanes and then back to 2 again, how does the app know that the pit area is on the front stretch? 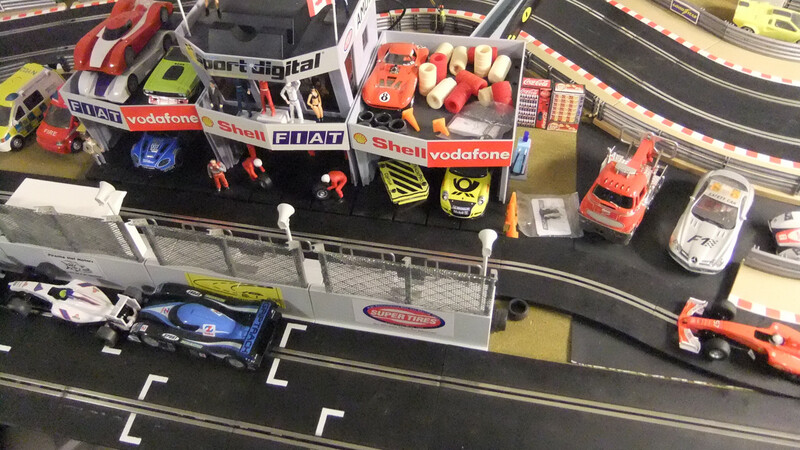 Or is any layout with a pit area limited to 2 lanes for the entire racing circuit? My understanding is that the powerbase is supposed to be placed before or after the pit area, and can not have the 1 to 2 lane expansion Pit Right pieces straddling it...that seem right? It doesn't. The pit is wherever you stop your car and hold the appropriate button. I don't believe the ARC and various apps *currently* have a way to restrict activity to a certain section of the track. I'm sure adding a sensor system is something people will eventually do, though. Interesting...thanks for that. That helps a great deal. Ordered the Platinum set this morning (along with 2 more controllers)...Can't wait to get started. With that configuration, do cars pulling in and out of the pits record a lap run? Last edited by gorp; 07-29-2018, 12:22 PM. So this app can be used with arc one, arc air, and arc pro bases? No, not with this current configuration. I need to place the ARC Pro base further down the straight so that when you come out of the pits the car crosses the ARC Pro Base. I was in a hurry to try out the base and this was the easiest spot at the time to put it. I may even have to shorten my pit lane by a section. I decided to revise my pit lane this afternoon. 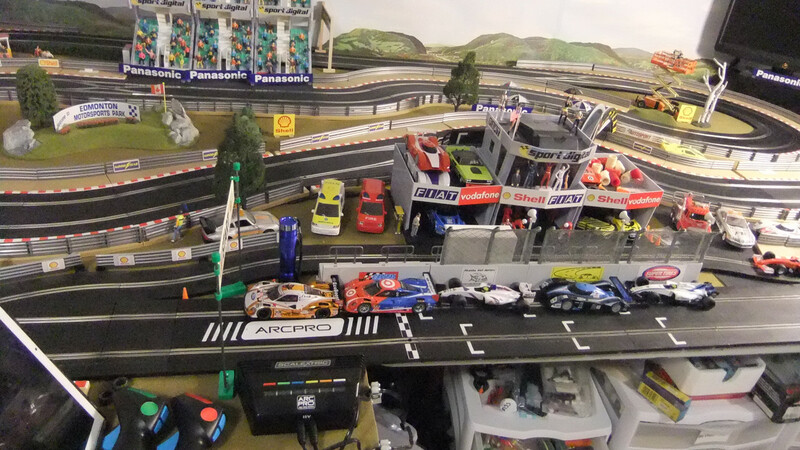 I moved the ARC PRO base further down the main straight and shortened the pit lane. The cars now record a lap when they leave the pit lane. Got it, thank you for the clarification. I am told by the USPS tracking information my ARC PRO GT set should arrive today...already downloaded and played with the MAGIC app as best I could without it being connected to a base, so functionality is somewhat limited. Very impressed with what I can see and do already. I just used Magic's app for a multi-pace car race for the first time today.. I set up my driver controlled car in the red power base slot, a pace car titled "Fast Car" in the green slot, and a pace car titled "Slow Car" in the blue. I set the race laps and time to unlimited and spent about 30 minutes weaving back and forth between the two lanes, trying to avoid the slow car and pass the fast one. When I got it just right, the app rewarded me with a prompt that said, "Fastest lap for Driver 1". The few times I de-slottted, I hit the yellow flag button, which stopped the race until I was back on the track and started it again when I hit the button. The app performed perfectly and I had a lot of fun. This was exactly what I wanted, and what I could not do when Scaly first introduced Arc Pro. Magic did a terrific job! Borninthe50's How has your Arc Pro set been working now that you have had it for a few weeks? Does the Magic app allow you to do the things you envisioned for racing and running multiple pace cars? I am contemplating a purchase of the same Arc Pro GT set and wanted input from someone who recently upgraded to the Arc Pro. Thank you. Hi Clark. I bought the arc pro powerbase when it first came out and designed my own layout as I already had a bunch of cars and track. My first impression was that I had made a big mistake because the Scaly app was much more limited and would not allowed me to do many of the things I liked about my 6-car Advanced powerbase with RCS. The Magic Arc App has fixed all that in my opinion. While it is not exactly the same it does everything I want and need, including multiple pace car races and very accurate race management. The final piece of the puzzle for me was adding a Galaxy Tab 6 Pad for about $200. Before that I was using my phone. This was frustrating because my phone kept exiting the app and because the sliders were too small to be able to use them accurately. This happened with both the Scaly and the Magic. With that problem fixed, I just race, by myself and with my grandkids. I love the wireless feature and the flexibility of the magic app lets me dial in the controllers and the power anyway I like and need to be able to race with my grandkids. 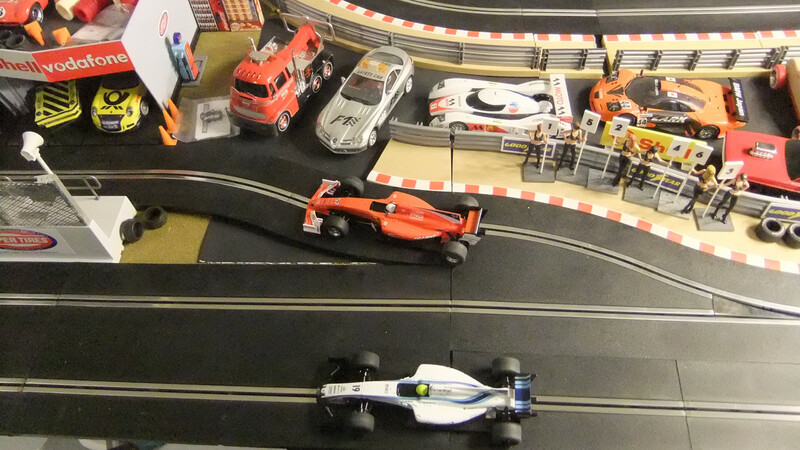 I do not have a pit lane in my layout. I work very hard to make my cars smooth and easy to drive, so it seems counter intuitive to use a program that actually makes my cars handle poorly. Still, I understand the concept and see why many people enjoy it. I just can't tell you much about it. Have Fun! Last edited by borninthe50s; 08-19-2018, 08:18 AM.